I had always wondered if somewhere there existed an image of Robert Cooper Lee. When he returned to England in 1771 he joined the upper echelons of society, people who often commissioned portraits of themselves either to grace the walls of their homes or to present to friends or family. Indeed we know that he had commissioned Francis Cotes to paint a portrait of his daughter Frances in 1769 when she was at school in England and the family were in Jamaica. Given the high rates of child mortality this might have been their last view of their daughter. Happily she survived as did her portrait, which is in the Milwaukee Art Museum and now graces the cover of A Parcel of Ribbons. 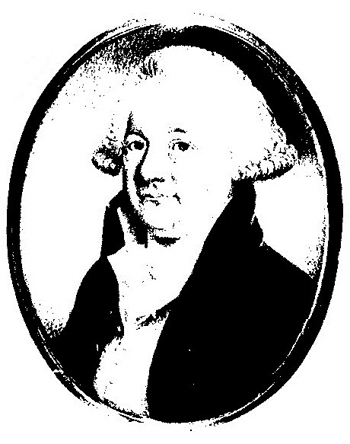 This black and white image of Robert Cooper Lee is a copy taken from a Christies’ Sale catalogue in 1979 when this miniature was sold. The person who found it is currently trying to establish whether a better image exists, and even whether the purchaser can be discovered so that the original can be photographed in colour in its original gold frame. Judging by the costume it was painted some time in the 1780s. Robert Cooper Lee died in 1794 aged fifty-nine. You might notice that he is not smiling. There is a whole history of picture making that relates to the smile – it is only in recent times, with the benefits of modern dentistry, that people smile for their pictures. Before then they did not wish to expose their bad teeth to view! Given that Robert Cooper Lee had spent two decades in the sugar producing colony of Jamaica, had probably chewed on raw cane and certainly used sugar in both food and drink, the chances are that by his fifties his teeth were not good. Another interesting aspect of the portrait is comparing it with his daughter Frances. It is impossible to know about colouring, since he wears a wig and we cannot judge the colour of his eyes, but the angle of the face is similar to that in his daughter’s lovely portrait and I don’t think it is fanciful to say that she looked very like her father. It has been a good week for my Parcel of Ribbons as I’m delighted to say it received a very good review in the June issue of Family Tree Magazine, which called it ‘family history gold dust’ ! There was also a lovely write-up on the Good Reads website. If you know of the current whereabouts of the Robert Cooper Lee miniature do please get in touch!